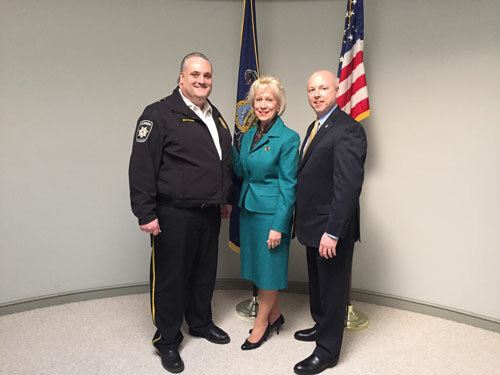 Rep. Karen Boback is pictured with Lackawanna County District Attorney Shane Scanlon and Sheriff Mark McAndrew. Scanlon and McAndrew will lead Boback’s Concealed Carry Seminar on Tuesday, April 11, at the Dalton Fire Hall. TUNKHANNOCK – Rep. Karen Boback (R-Lackawanna/Luzerne/Wyoming) will offer a Concealed Carry Seminar on Tuesday, April 11, from 6-8 p.m. at the Dalton Fire Hall, located at 109 S. Turnpike Road, Dalton. The seminar is open to all residents of the 117th District who are interested in learning about Pennsylvania’s concealed carry laws and the Castle Doctrine. Lackawanna County District Attorney Shane Scanlon and Sheriff Mark McAndrew will present information about how recent U.S. Supreme Court decisions affect the Second Amendment rights of citizens. Doors will open at 5:30 p.m. at the program begins at 6 p.m. Seating is limited and reservations are required. To register, call Boback’s Tunkhannock district office at 570-836-4777, her Dallas office at 570-675-6000, or register online at RepBoback.com.